In the immediate vicinity of Bayonne, less than 10 minutes from the city center. 20 minutes from the center of Biarritz and its international airport. 20 minutes from the beaches and golf courses of the Basque Coast. 25 minutes from Saint-Jean-de-Luz. Less than 5 minutes from shopping centers. Less than 5 minutes from a motorway junction serving Bordeaux, Toulouse or Spain. 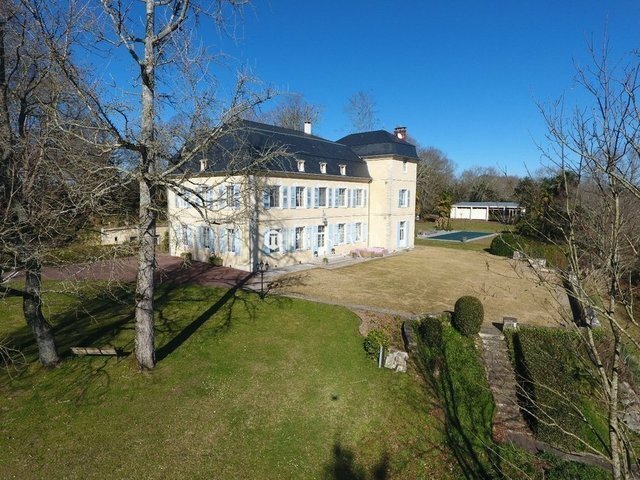 Country property for sale near Bayonne, combining calm and space, is a castle for sale near Biarritz, built between 1684 and 1734 with its orangery as a dependency and large swimming pool. Rare chateau for sale on the Basque Coast in perfect condition to be located so close to the beaches of the Basque Coast. Surrounded by a park of 4 hectares, this castle has been completely renovated, roofing and facades included, with the care of preserving the original materials. Enjoying a dominant position and facing south the castle offers a panoramic view of the countryside in the foreground and the Pyrenees in the background. More than a castle for sale at the gates of Bayonne, it is a warm home in perfect condition, rare for sale on the Basque Coast, comfortable and a human size. Covering an area of approximately 600 m2, this remarkable maison de maitre is spread over 3 levels and comprises 12 rooms, including 7 bedrooms, 5 bathrooms or shower rooms. Very nice charming property for sale on the Basque Coast combining the classic charm of stone, calm, space and views.